• Keep a food and mood diary – record everything you eat and drink along with how you feel for a week then see if there is a link between certain emotions such as feeling sad, angry, miserable, tired or depressed and what you have eaten. Once you have identified any links, work out strategies that don’t involve eating for dealing with these emotions. • Avoid extreme dieting, fasting and skipping meals – without glucose the brain can’t work properly and so craving a sugary snack when blood sugar levels are low is most likely a survival mechanism designed to help us seek out a food that will provide a quick source of sugar for out brain. • Work out why you crave specific foods – most people don’t crave broccoli or apples. Instead its more likely to be sugary or fatty foods. Think back to your childhood and you might discover the reason you crave sweets when you are unhappy is because you were given them as a child when you were upset. Once you start to understand why you want certain foods, you will find it easier to change the habit. • Ask yourself whether you are hungry – when the craving hits, rate your hunger on a scale of 1-10 where one is starving and 10 is stuffed. If you are at the low end of the scale then it’s probably hunger (and the associated low blood sugar levels) that is driving your desire to eat. The solution is to opt for something healthy (nuts or cheese) rather than a quick fix. If you are 7 or above then hunger isn’t likely to be a factor in why you want to eat but rather a response to how you are feeling. • Distract yourself – cravings often go away if you are distracted so do something else (phone a friend, go for a walk, clean out a cupboard, for example) and see if they pass. 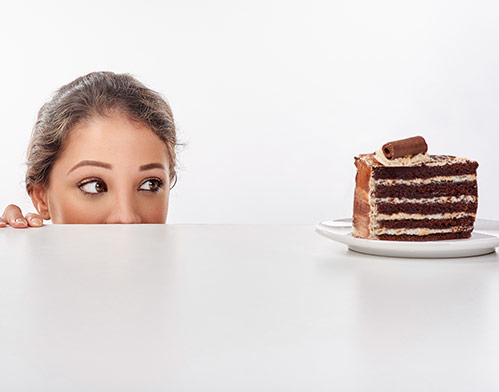 • Keep tempting foods out of reach and sight – studies show if you can see a food then you are more likely to eat it. • Pasta and Cheese- Wholegrain pasta has a low GI and so is great for steadying blood sugar. Plus, cheese is rich in tryptophan as well as B vitamins.